Your hair takes a beating in the winter. Between biting wind and searing cold, not to mention the assault of the fuzzy woolen hat, your hair battles the elements every day for months on end. So it needs a little extra care to help it come out the other end in spring, without those ends being split. The following tips will guarantee that your locks will be as beautiful as those new dewy flowers come March. On average, hair grows about ½ an inch every month, so getting a trim every two to three months won’t put a stopper in your goals of growing your hair out. In fact cutting off dead or dying ends will keep your hair healthier and allow it to grow more. With the weather stripping much of your hair’s natural protectors, your hair will damage faster. So even if you want longer locks, keep on schedule with your trims. If your style is the perfect length for you as is, aim for a trim every four to six weeks instead for maintenance. Constantly running your fingers through your hair or pulling it up/taking it out of ponytails, messy buns, and hats cause more breakage. Use a simple style like a messy French braid or slicked ballerina bun that won’t tempt you into readjusting all day long. Remember, your hair is already at risk for more damage because of the weather; there is no need to make the damage risk higher. Fuzzy hats can create static and breakage throughout your strands, but they also protect your hair from the harsher elements. There is a way to wear hats without damage though! Run a dryer sheet over your hair before you put on a hat to eliminate the static cling and try not to put it on and take it off frequently. Spraying your style with a shine spray can also slicken your strands enough so that the hat doesn’t pull or snag on your hair. One of the most dangerous environments for your hair is going outside in the cold when your hair is wet. While air drying is the healthiest method to dry your hair, using heat styling products is less damaging than freezing your hair when you leave your house. If you don’t have enough time to air dry, use a leave-in conditioner before you break out the blow dryer, flat iron, or curler so that your ends don’t break along with it. 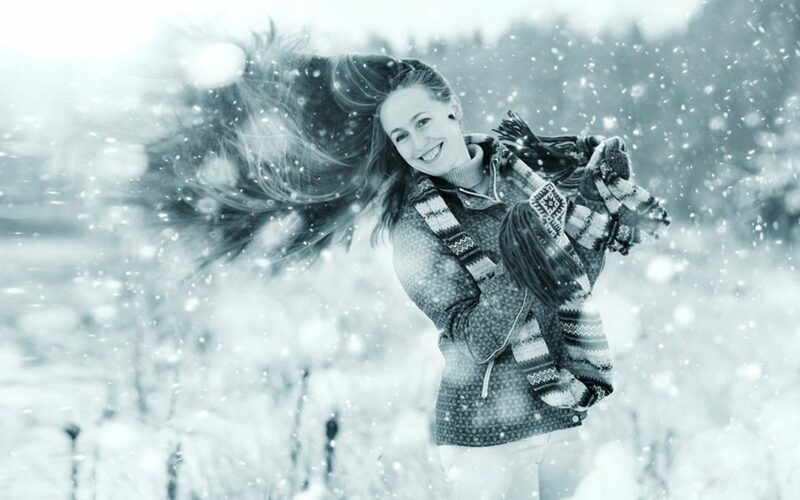 Using a strong conditioner is one of the best ways to prevent winter damage on your hair. Not only does conditioner keep your hair shiny and silky, but it also keeps in moisture. The dryer your hair, the more likely it is to break in the wind or cold, so maintaining moisture is key! It sounds counterintuitive, right? Yes the outside chill to the air causes damage to your strands, but taking a hot shower will cause damage too! Turn the heat down in your shower to protect your hair and your skin from excessive heat. Reducing the number of times you wash your hair during the winter to only a few times a week can also mitigate some of the damage of a hot wash. Your hair can’t fend for itself, so it needs your extra care and attention during the winter to ensure that it will look as great as your home after Spring Cleaning!